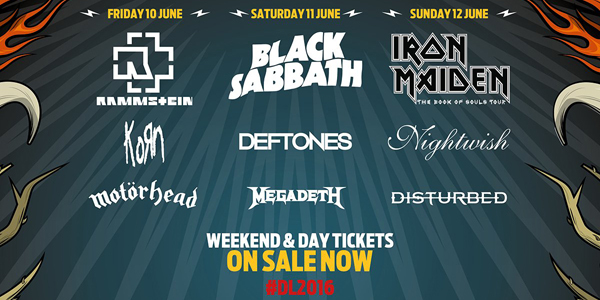 We’re now less than 2 months away from the great Donington festivities of the year that are, of course, the 2016 Download Festival. The Download powers that be have seen fit to grant us all with another dozen bands of all shapes and sizes. Kicking things off are British veteran metal favourites Raging Speedhorn, returning to Download for the first time since 2005. Raging Speedhorn will headline the 4th stage on Friday night, presenting yet another interesting choice on a night that already has Gutterdammerung, pop punk royalty All Time Low and industrial metal legends Rammstein as headliners of other stages. From Northamptonshire to Hollywood, actress Juliette Lewis is bringing her reactivated punk rock group Juliette & The Licks to Download for the first time. The other ten bands to join the Donington fun are a mix of homegrown talent and International up and comers. Inspired by the original giants of the genre, US nu-metallers From Ashes To New would love to repeat the Donington success of the likes of Limp Bizkit & Linkin Park. Scottish rockers The Amorettes have been on the rapid rise over the last twelve months or so, and will look to continue their ascent by wow’ing the Donington audience. 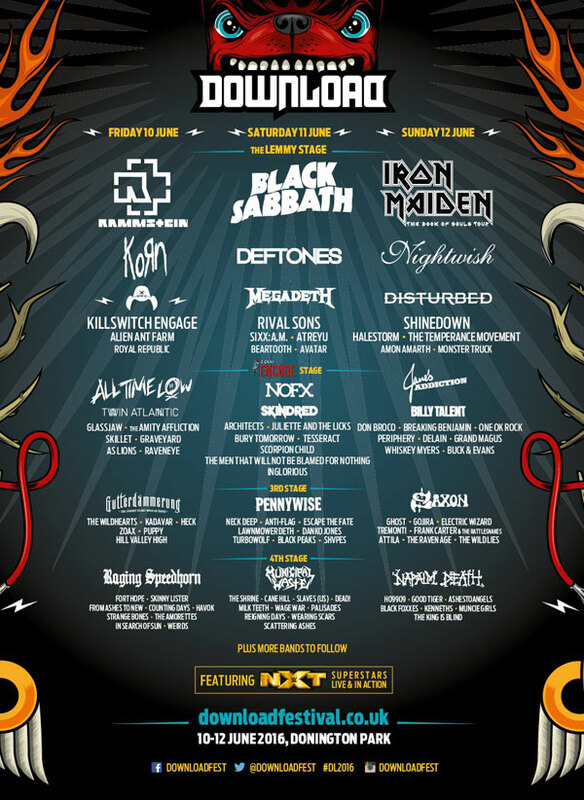 From the ashes of both Sacred Mother Tongue and Mutiny Within, Wearing Scars have emerged and are going places, and in this particular instance – straight to Donington for Download 2016! In 2015 The Wild Lies proved such a hit at Download that they’ve been invited back for a second appearance in two years, this time on the Pepsi Max Stage. Comedian Andrew O’Neill will be appearing in a new guise at Download as part of The Men That Will Not Be Blamed For Nothing, with a cross between crusty punk and cockney sing songs being the way to describe their sound, it would seem they need to be seen and heard to know just what to expect. Folk music is one of the more rarely heard guitar based genres at Download, but that will change a little this year with the addition of Skinny Lister to the 2016 Download line-up. Four more bands will also be joining the fray – blues rockers RavenEye, modern classic rockers Inglorious , grunge rockers Puppy and melodic tech metallers In Search Of Sun will all be taking to the Download 2016 stages. 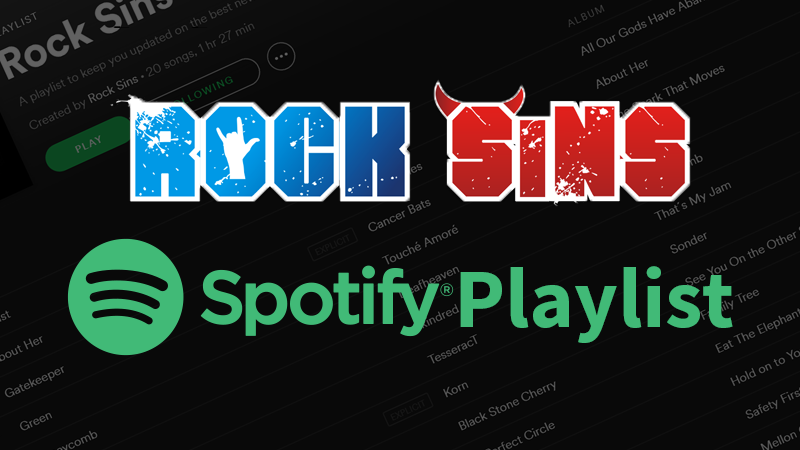 All of these bands will join forces with the dozens of bands already announced, plus the recently confirmed superstars of WWE’s NXT to form the 2016 Download Festival. Tickets and all the other info you may wish to read can be found at www.downloadfestival.co.uk – with more acts still to be announced in the coming days. We can’t wait!